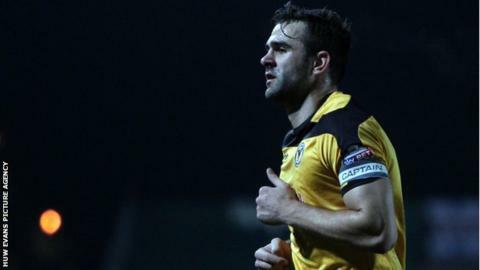 Former captain Andy Sandell admits he fears for the future of Newport County following his release by the club. The midfielder, 31, is one of 11 senior players released by manager Terry Butcher in a bid to cut the League Two side's wage bill. Former Bristol Rovers player Sandell fears the changes could have a detrimental effect next season. "Releasing so many players, it's going to take time for all those new players to gel," said Sandell. "Football's a short season and if they don't gel quickly bad things can happen. "But hopefully for the club... everyone starts working with each other and hopefully they'll have more success in the future." Former England captain Butcher succeeded Justin Edinburgh, who left for Gillingham in February. County chairman Les Scadding says Butcher will have less money at his disposal than predecessor Edinburgh. Jimmy Dack had been in charge following Edinburgh's departure and Sandell said a reduced budget was a factor in the caretaker manager's decision to turn down the offer of a permanent role. "When you do cut the budget like they have it becomes difficult," Sandell told BBC Wales Sport. "I think that's one of the main reasons why Jimmy distanced himself from the job." Sandell was a member of the Newport side which secured promotion to the Football League with a 2-0 win over Wrexham in the Conference play-off final in 2013. He was surprised and disappointed at being released, adding that it marked the end of an era. "We know of the budget cuts and things like that but when you are released it come as a little bit of a surprise," Sandell said. "I would have had to have stayed on reduced wages and just like everyone else I've got bills to pay. I need to earn a certain amount of money to survive. "I'm in the same boat as the rest of the lads and obviously now we've all got to look for new clubs."